Adam Hochschild’s first book, Half the Way Home: a Memoir of Father and Son, was published in 1986. It was followed by The Mirror at Midnight: a South African Journey, and The Unquiet Ghost: Russians Remember Stalin. His Finding the Trapdoor: Essays, Portraits, Travels collects shorter pieces from several decades. King Leopold's Ghost: a Story of Greed, Terror and Heroism in Colonial Africa won a J. Anthony Lukas award in the United States, and the Duff Cooper Prize in England. 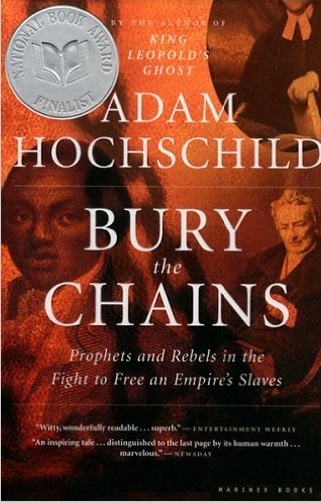 Bury the Chains: Prophets and Rebels in the Fight to Free an Empire’s Slaves, a history of the British antislavery movement, was a finalist for the National Book Award and won the Los Angeles Times Book Prize. For the body of his work, he has received awards from the Lannan Foundation, the American Historical Association, and the American Academy of Arts and Letters. His To End All Wars: A Story of Loyalty and Rebellion, 1914-1918, was a finalist for the National Book Critics Circle Award and won the Dayton Literary Peace Prize. His books have been translated into fifteen languages. Hochschild has written for The New Yorker, Harper's, The Atlantic, The New York Review of Books, Granta, The New York Times Magazine and other publications, and was one of the co-founders of Mother Jones magazine. He teaches at the Graduate School of Journalism at the University of California at Berkeley. I write books of history that are accessible, I hope, both to people in the academic world and to the general public. I particularly enjoy writing about times and places where men and women were fighting injustice—whether that was the slave trade, apartheid in South Africa, Stalinism in Russia, African colonialism or the senselessness of the First World War. That’s an absurd question! People have been writing for more than two thousand years, and you want me to claim that I’m the best? Come on, now . . . I try my hardest, but I’m still a mighty small fish in a mighty large pond. See my answer above. I try to stay on top of my game by studying the work of writers who are better than me. Will I ever write as well and memorably as Orwell or Tolstoy? Of course not. But by taking apart their books and those of dozens of others, looking for the inner architecture, I hope to learn some principles I can apply to my own work. Personal: To stay healthy and try to be a decent human being. Business: To keep writing and teaching as long as I can. And to learn from those I teach. Moments when people defied the orthodoxy around them and questioned something everyone else was taking for granted. Why did Rosa Parks not go to the back of the bus? Or, to take the cases of two people I’ve written about, why did 25-year-old Thomas Clarkson, in 1785, decide that slavery was a terrible crime, when most people in the British Empire thought it was part of the normal order of things? Why did a young shipping clerk named E.D. Morel, at a dockside in Belgium, see evidence of a forced labor system thousands of miles away, which people around him had previously ignored? See my books “Bury the Chains” and “King Leopold’s Ghost” for these stories. The three I’ve mentioned above are certainly among them. Others I’ve written about in other books. In “To End All Wars” I described some of the wonderfully colorful array of people who had the courage to resist the madness of World War I. New York City—the center of the universe. And living proof that people of many different creeds, colors, ethnicities can in fact—albeit sometimes with difficulty—live together. The printed book. More than 500 years old and still the greatest invention. Thank you, Mr. Gutenberg!